Jason is an Advanced Trauma Paramedic for London’s Air Ambulance, and says it’s the best job he’s ever had. When did you become a flight Paramedic? 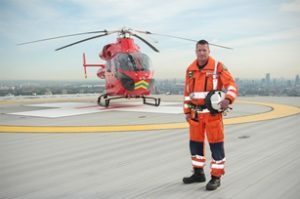 I’m a Clinical Team Leader with the Service and I’ve also been an Advanced Trauma Paramedic for London’s Air Ambulance for the past six years. What is it like working as part of the team on London’s Air Ambulance? Even after all this time, when you hear the klaxon which signals that a patient needs us, your heart will speed up and the adrenaline will still run. One minute you’re sitting there and the next you’re off to treat the sickest person in London. What does being a flight Paramedic mean? As an advanced trauma paramedic, our role has two jobs; it’s a 50/50 split between the control room and treating patients alongside a doctor. Treating on average five critically injured people a day we have one advanced trauma team for London; using a helicopter by day and rapid response cars by night. We have to send them to the right person and making those decisions can be quite challenging. The person in the control room is pivotal and without them the service wouldn’t exist. Yesterday I spent 12 hours in the control room sifting through the 5,000 calls looking for the types that London’s Air Ambulance would attend. When we’re on duty at the helipad, we start the day at 6.30am and carry out lots of checks. We have a briefing at 9am and carry out training throughout the day, when we’re not treating patients. What would you say to someone who aspires to become a flight Paramedic?